Thomas Taylor Hunt, an Englishman from Lancashire, immigrated to this country to take employment as a glass cutter at the Dorflinger Glass Company about 1878. Two or three years later he moved to Corning and began cutting glass at the newly established Hawkes Rich Cut Glass Works. It is generally believed that Hunt’s son, Harry S., learned his trade as a glass cutting at the Hawkes factory. In 1895 the Hunts left Hawkes to establish their own cutting shop, initially in partnership with Daniel Sullivan and later in association with his nephew, James Sullivan. 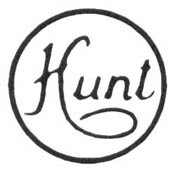 In 1907 James Sullivan was bought out by the Hunts, father and son, and the Hunt & Sullivan company became known as the Hunt Glass Company. Thomas Taylor Hunt died on 14 Apri 1909, at which time Harry S. became the company’s president. The earliest company invoice that is extant is dated 20 Apr 1909; although Hunt senior had died, it still lists him as president, along with M. E. Hunt (Mrs. Thos. T. Hunt) as vice-president, and Harry S. Hunt as secretary and treasurer. The next invoice that is available is dated 13 Jul of the same year. It lists Harry S. as president, N. M. Fuller as vice-president, and C. L. Hunt as secretary and treasurer. N. M. Fuller (Mrs. Fred Fuller) also acted as business manager at this time until she left “to found a company of her own, but this firm probably subcontracted for Hunt” (Sinclaire and Spillman 1997, p. 126). This could have occurred by 23 Jan 1914. An invoice with this date has her name and position blacked out. Subsequent invoices, the last dated 6 Jul 1915, list only the company’s president, H. S. Hunt and its teasurer, C. L. Hunt. Harry S. Hunt died in 1935 and his son-in-law, Walter Sullivan (unrelated to the earlier Sullivans) became president. After the Second World War Walter Sullivan’s sons, Walter Jr., John, and eventually Thomas J., joined the company. At this time the post-brilliant period of American cut glass had passed and the “decline in business that had begun in the 1950s continued and deepened.” (Sinclaire and Spillman 1997, p. 130) After 1970 the heirs of Harry Hunt’s son-in-law, the later Sullivans, eventually lost control of the company, and the factory closed about 1973, an event that “went virtually unnoticed in Corning” (Sinclaire and Spillman 1977, p. 130). The illustrated trademark, above on the right, is said to have been acid-etched on glass from 1906 to about 1915. In later years it was used on paper labels. [1911 (or later) Catalog] FINE CUT AND ENGRAVED GLASSWARE. With original prices. Twenty plates (plate no. 4 missing). Fifteen invoices have been added to the microfiche. Available only on microfiche, CMG f-12885C. The Rakow Library does not own the original catalog. The ACGA reprinted this catalog in 2007 with the title THE HUNT GLASS COMPANY. The writer has not yet seen a copy of this reprint. Complete list of patterns in the foregoing catalog: Aldine, Avon, Brazilian, Century, Colonial, Chrysanthemum, Corona, Diana, Empress, Hudson, Iris, Mascot, Nevada, Peerless W. R., Primrose, Queen, Regal, Reliance, Rome, Royal, Royal W. R., Special, Stafford, Star, Starlight, Vera, and Century. Century, however, has been crossed out and the name Celtic added in script in this copy of the catalog. The letters W. R. stand for Wild Rose(s). When added to the Peerless and Royal patterns, which are entirely geometric, two new patterns that include stone-wheel engravings of wild roses are created. The catalog contains several examples of the entirely geometric Royal pattern, but it does not include a single example of the entirely geometric Peerless pattern, a pattern that most likely was also cut by the company. 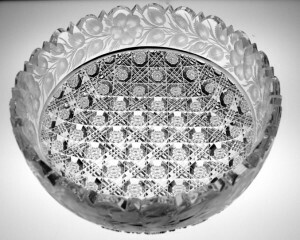 Note that the list of patterns that is given on page 131 of the 1997 edition of THE COMPLETE CUT AND ENGRAVED GLASS OF CORNING by Sinclaire and Spillman is incomplete. Several patterns are missing. And one, Peerless, should have been listed as Peerless W. R.
Hunt’s Diana pattern, often unsigned, can easily be mistaken for unsigned Tuthill. 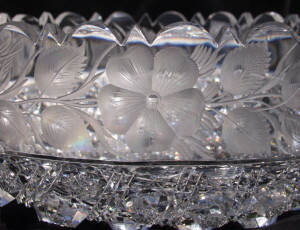 This 9″ (22.9 cm) D bowl, h = 3.75″ (9.5 cm), was offered for sale as an “incredible Tuthill brilliant cut glass bowl” on eBay during 2006. Fortunately, the starting bid, $1,525, failed to attract a single buyer so the item did not sell. Fortunately, because had it sold, an injustice would have been done.